Born in 1976, Ciro Grandi graduated with honours at the University of Ferrara in 2001 and spent the following year as a research fellow at the University of Utrecht. 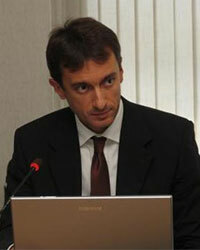 In 2005 he became lawyer at the Court of Appeal of Bologna and he obtained his Ph.D. in Criminal Law in 2006. Since 2008 he is Researcher in Criminal Law at the Department of Law of the University of Ferrara, where he teaches Criminal Law (Special Part) and European Criminal Law and coordinates the Erasmus exchange programme. He is member of the Academic Board of the Ph.D programme in “European Union Law and national legal systems” at the University of Ferrara. He is member of the Editorial Board of the review “La legislazione penale”. He was Erasmus Professor at the Vilnius Law and Business College in 2009 and at the London Metropolitan University in 2014. He has obtained the national abilitation as Associate Professor in Criminal Law in 2017.